The original short message service provider of New York died this week. Karl Ehrhardt's signs presaged Twitter and text messaging by more than three decades, and I remember that his short messages provided clever exclamation points to what the Mets did on the field. An advertising copywriter and big-time Mets fan, Ehrhardt was 83, and had packed away his signs years ago. But for those of us who lived at Shea in the era from (roughly) Seaver, Jones, Grote and Koosman through Kingman, Taveras, and Hubie, the sign man of Shea gave us brief tidbits of wit and commentary. When the Mets won it all in '69, Ehrhardt flashed a short, sweet message: "There are no words." In an age before JumboTrons and flashing "Make Some Noise!" graphics, the Sign Man was our SMS system at the ballpark, our baseball Twitterer - the Jenny Holzer of Shea Stadium. UPDATE: Paul Lukas at the brilliant UniWatch site has a great post on the sign man. Once upon a time, obsessive reporters of the arcane were relegated to Usenet or mailing lists - or God forbid, swap meets and paper newsletters. Thanks to the wondrous machinery unleashing blogs, however, even the most narrow of subjects get a full and broad airing, with plenty of real reporting and humor thrown into the bargain. Take sports. Sure, there are blogs for every professional sports franchise, every league, every college team, every tiny sport of any kind. But I've fallen hard for two that slice those sub-sets even smaller. One covers sports stadia and arenas - specifically the politics around new buildings. Field of Schemes takes a decidedly negative stance to deep-pocketed team owners going on the public dole to build more luxury boxes and is an equal opportunity basher of stadium deals. Also a terrific read - as is Uni Watch, a blog by Paul Lukas, who also writes about the same subject for ESPN. Uni Watch is also relentlessly negative, zeroing in on hideous choices sports teams make on their haberdashery. Included many times over is a pet peeve of mine: those super-long baseball pants, which have replaced the classic baseball socks of yesteryear on today's diamond stars. In the latest ESPN column, Lukas asks for votes on the ugliest sports uniforms of all time. Some particularly hideous choices, including the old Chisox 80s look. Would that the Mets would listen to Lukas and do away once and for all with their lame black/blue combo and stick with the classic pinstripes. That and bringing back the traditional stirrups - as seen above in the classic Cardinals look. West Kirby, originally uploaded by Tom Watson. The sportswriters make all of Merseyside seem like it's just now recovering from the havoc wrought by German bombers and Thatcherite privatization, but it's not true. As the best golfers in the world tangle along the grass of Royal Liverpool in 100-degree heat - and guys like John Daly channel the Beatles at a rebuilt-for-tourists Cavern Club - a rare international eye is turned Liverpool's way. And the reputation that's dragged up is hardscrabble at best. But Merseyside is, in reality, a diverse area with tough, inner-city neighborhoods only a few short miles from windswept coastal scenes of great beauty and simple farming towns. The Wirral, across the Mersey from Liverpool, is home to the bigger, urban towns of Birkenhead, Wallasey, and New Brighton. But the mallet-shaped peninsula is also bound by the Irish Sea and the Dee, a tidal estuary separating it from the hills of northern Wales. Along that coast, at the corner of the rectangle facing Wales and Ireland, is the sandy spit where Tiger, Phil, and the rest of the greats are battling in the Open Championship. Royal Liverpool stretches from Hoylake in the west to West Kirby, around the bend. Both towns are what you would call upscale, by the way - the Wirral's gold coast. There's a winding path that runs through the dunes along the edges of the course, and to walk its several miles is to escape any notion of downtrodden northern England. At the end of the walk is the wide, wide beach at West Kirby. 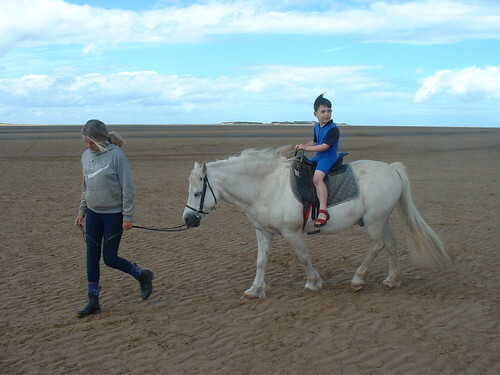 There a few years back, we paid 50p for Devon to ride a pony on the sand. It's one of my favorite photographs. He's bigger now. But as I caught a glimpes of Tiger struggling in a pot bunker, the wind kicking up the sand, I could see over his shoulder in the distance the wide vista along the coast. And I remembered that pony ride and a very special place. UPDATE: Man, Tiger looked great. Jason has a good post on golf's Rifleman. And Blue Girl says Tiger represents perfection, though I suspect for different reasons. Absolutely, sudden death is the way to go. 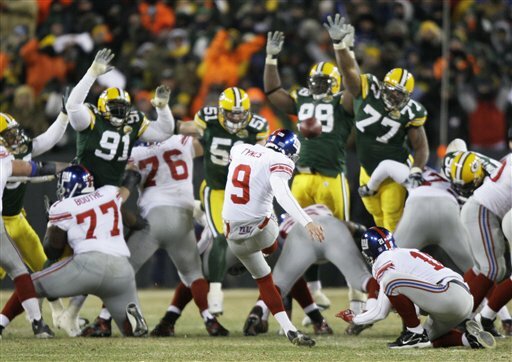 Back in 98, FIFA instituted the "golden goal," international soccer's version of NHL overtime. France beat Paraguay on one about 23 mins into OT. For some reason this format was overruled, and we're back to the same old skills competition to decide who moves on. Absurd. Maybe they're worried about a fluky goal deciding a major championship, or maybe it's a matter of exhaustion, but the alternative is far worse: rigid, boring, matter-of-fact penalty kicks. Look at the NHL playoffs: there is no truer sudden death sport than playoff hockey. Every misplay, every non-clear, every hit not taken can quickly end your night, or your season.And if the FIFA guys want to talk tired, just show them a tape of the five ot Penguins-Flyers game from 99, and tell to keep on playing. UPDATE: The perfect example was today's Italy-Germany semifinal - imagine the lack of real excitement if it had gone to kicks. The late goals were astonishing, and well-earned - they should play 15 min OT's till someone scores. Quite a show today by Tiger Woods: oh yeah, mainstream, big media is dead folks. As long as there is an Open - The Open Championship - on a scratch of seaside turf, swept by winds and gulls and sand, millions will tune in to watch from all over the world. This morning, Tiger Woods did not disappoint. Fred Wilson is also a fan, I see: he correctly argues that we root for Tiger like we used to root for Jack Nicklaus, who retired from major championship golf this week with a fianl turn down St. Andrews fairways. Except, I didn't really root for Jack. Although I admired Nicklaus, I rooted (not shockingly) for young Tom Watson, out of Kansas City. And it was fitting that Tom Watson, my favorite pro and the reason I've endured endless golfing jokes over the years, walked with Nicklaus on the last round. Even more fitting that Watson made the cut, and finished today with a surprising and strong one under par, 13 strokes back of the winner. Watson won five British Opens in his prime, more than any modern player and remains a long-time crowd favorotie in Scotland and England. Watson is an athlete of rare character; when his home country club in Kansas City was derided for no accepting Jews in the 1980s, Watson very publicly quite its ranks. And when his longtime caddie Bruce Edwards contracted ALS, Watson supported him, kept him at his side, paid his medical bills, and raised money for research into the insidious disease. In an era of egos, Watson is uniformly regarded as a gentleman. Now 55, he plays the Senior Tour, a few PGA events, and the majors. Including the Open Championship. I'm not sure there's a better event on televised sports. But next year, I'm determined to skip the telly (though I do miss ol' Jim McKay) - the Open returns to Royal Liverpool at Hoylake (where I took this picture two years ago), just down the lane from where my wife's family lives on the Wirral, between Liverpool and Wales. I walked the dune trail along the edge of the course about a decade ago. Next year, I'm determined to see it all in person. I am 53 years old and ... have been following your career since the early years. Actually my father was a fan first, and he passed away in 1980, so you know how long we (got my family involved) have been pulling for you. In the beginning, the difficulty closing the deal, Pebble and some others if my memory is correct, to you becoming a terrific champion and ambassador of the game. I guess the best thing in my mind about hoping you win is you are so human and human about it all (the status & fame) ... I believe I know as much about the golf swing and have experimented with the golf swing as much as anyone but I share your quick tempo and need to play with that feel. I was so happy you won today, gave us a couple shivers along the way, I have the same putting woes. All those years we cheered and hoped you would get it back (never lost confidence or hope, how about that downhill putt at the Memorial, I think I was more relieved than you, easier to play than watch), something we are all striving for. I was really moved by your performance and last round with Jack Nicklaus at the British Open. That look in on your face at the 18th was priceless and is the same respect us average Joe's have for our playing friends who respect the game, competition and friendships. Everyone I spoke with felt the exactly the same way. Anyway, I am thrilled you won today & hope you play a little more on the Senior Tour (a good reason to watch), in fact the regular tour is OK too ... By the way, that was a great thing you did for Bruce, a great lesson for my son in relationships and lifelong friends (he is 11).